Figure out exactly where you want the raised bed, and how big it’s going to be. Take your time on this one because, once it’s built and filled with soil, it will be tough to move. Assemble your tools, and go shopping for the stuff you don’t have lying around, like the corrugated pipe or PVC brackets (and if you have those types of items on hand, please move into the house next to me). Also, determine if you want an irrigation system at the bottom — we wanted to cover the existing yard space with plastic and put in pipes so that plants could get water from the roots as well as from the soil surface. If you want raised beds without this system, you get to skip the irrigation strategies, and your beds will be shorter in depth than ours, as a result. Lay out your bed in a rough configuration of where you want them. Our beds are 10 feet long and 4 feet wide. We chose that size because we wanted to be able to plant and harvest from both sides. The depth is 10 inches, to accommodate the irrigation pipes and 6 inches of root space. We used four 2×6 planks and four 2×4 planks, and then pieced them together with the shorter brackets. Because we wanted to hoop the beds for colder days (this is Minnesota, after all), and cut down on direct sun during warmer days, we went with a simple PVC structure. Cut down your long, largest pipe into smaller sections, and then secure them with galvanized brackets. These will act as holders for each hoop segment. Drill a guide hole first and then use the screws. Whenever we tried to skip this step, our cordless drill expressed its unhappiness by stripping the screw heads. Secure the bed together with screws. This tends to make the structure sturdier than using nails. Take your smaller PVC pipe, insert one end into the PVC bracketing, and then bend the pipe over into the bracket on the other side. Be sure to have a very strong grip on the pipe because it can snap back on you if you let it go. If this happens, believe me, the bruise can be very colorful. At this point, you can choose to fill the raised bed with soil and congratulate yourself for an expert DIY job. Or, if you’re going for the irrigation system, lay down the thick plastic sheeting inside the bed. This eliminates weeds from growing into your new bed, and also creates an effective water/oxygen reservoir. Drape the sheeting over the sides of the bed by a few inches and secure the corner and sides on the inside with fabric/greenhouse staples for a tighter fit. Put down a thin layer of soil. This will help to hold the drain tubes into place. Cut the corrugated, perforated plastic drain pipe so that four sections fit inside the beds, on top of the sheeting. We used a quirky power tool, a Black & Decker Alligator, and it worked very well, but you could also do the job with a handsaw, circular saw or table saw. Drill or cut a hole in one of the sections and put a 1 1/4-inch PVC tube halfway into the pipe. It should be tall enough for convenient watering, sticking out a few inches above the planting surface. This will allow you to fill the pipe once the soil is in place. Fill the beds with soil and smooth it out evenly over the drain tubes and the bed. Stand back and admire your work — invite a few neighbors over to marvel at the precision, maybe. Then, do some planting. Water seeds from the top, but also make sure to regularly fill the drain tube. Although it might seem strange that you only fill one tube to get irrigation to the entire bed, it really does work. To keep out bugs and protect plants from chilly nights, we put re-lay fabric/row covering over the hoops and secured them with small clamps — potato-chip-bag clips work sometimes, too, or binder clips. 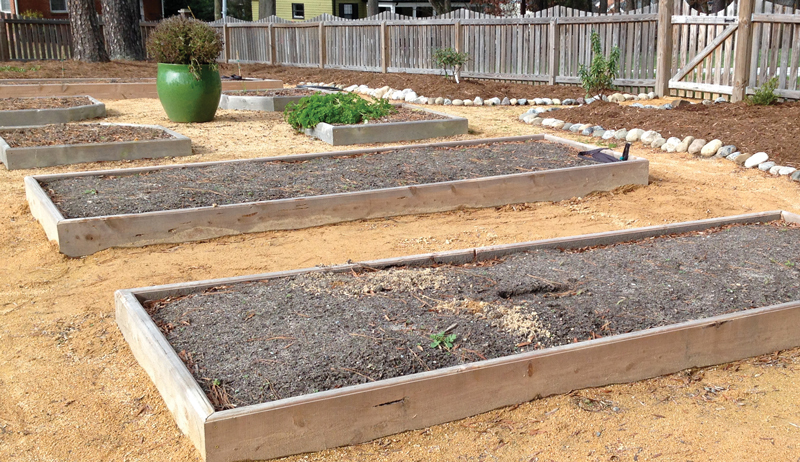 That’s it … the raised beds look good, and make the most of our small backyard. Plus, with the irrigation system, they tend to use less water than our other plants. Happy building!